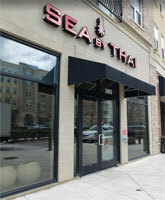 In West Broad Village neighborhoods of Henrico County, Sea By Thai serves delicious, fresh, and authentic Thai cuisine. We are open for lunch and dinner seven days a week, feature a full bar, (including liquor, wine and beer), and offer dine-in, carryout, and delivery (via Doordash.com). Sea By Thai opened our doors on Friday January 12th, 2018 with the concept “Eat, Drink, Chill Out” under a contemporary relaxing atmosphere. Our customers enjoy not only authentic Thai food but also a total Thai experience. 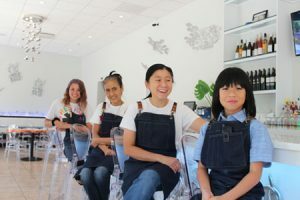 The moment you walk through the doors you will be greeted with a warm welcome by the owners and staff. While dining you will enjoy the Thai atmosphere and ambience of Sea By Thai. Complete your visit with us by tasting one of our delicious Thai dessert items and allow us to thank you for choosing to dine with us. Birdie Pavichitr is the founder and one of the executive Chef of Sea By Thai. He learned to cook from his mother in Thailand where he helped her in the kitchen since he was a little boy. 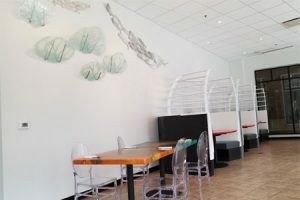 Birdie has managed restaurants for more than a decade. He graduated from VCU in late 90’s and he has lived in Richmond for more than twenty years. He opened Sea By Thai in the neighborhood where he has lived since 2013 with beautiful wife, Sue, and their lovely son Shin. Tammy Clark is co-founder of Sea By Thai and a close friend of Birdie. 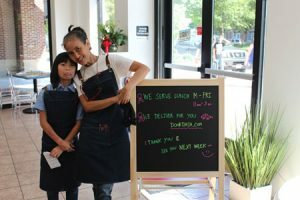 Tammy worked with Birdie side-by-side at Tara Thai restaurant from 2004 to 2017. She is very friendly and outgoing. Tammy enjoys talking with customers to make them feel at home. Feel free to come and say hello to her when you visit us. We invite you to come to Sea By Thai for lunch and dinner. We are open seven days a week from 11:00am to 9:30pm Monday through Thursday, 11:00am to 10:30pm Friday, 12:00pm to 10:30pm Saturday, and 12:00pm to 9:00pm Sunday. Whether you are an experienced Thai connoisseur or new to the food of Thailand, we welcome you here at Sea By Thai. We invite you to join us for lunch or dinner seven days a week. Visit us to enjoy an authentic Thai meal, lunch or dinner. If you have specific dietary requirement please ask your server. In addition to dining at Sea By Thai we offer On Line Ordering and delivery via DoorDash. Copyright © 2019 Sea By Thai. - All Rights Reserved.